An American spy plane, listening out for signals intelligence high above international waters in the Baltic Sea, was forced to hightail it to Sweden to avoid intercept by Russian fighter jets, according to the New York Times. This sort of thing has happened before, but this incident is definitely weird. 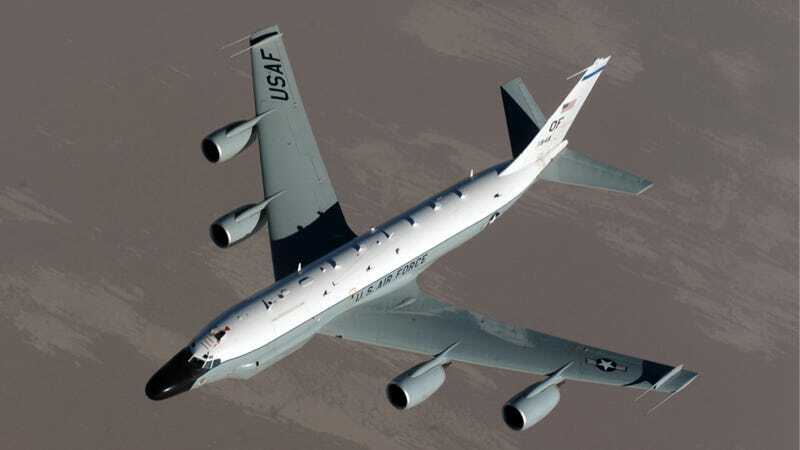 The American plane, an RC-135 primarily designed to monitor communications and/or radar signals, made it to Swedish airspace over Gotland Island before air traffic controllers "informed the aircraft of the mistake," the Times report said. The US military European Command added that the plane headed for Sweden "incorrectly." Sweden is a strong US ally, but not a member of NATO, so what can only be described as mild disappointment is probably the worst of the diplomatic fallout from the Swedes. Plus, they probably remember all too well the Whiskey on the Rocks incident, and other similar incursions, which should factor into any potential repercussions. But Sweden's level of response isn't really the weird part here, as that all looks to be standard operating procedure. The weird part is why the plane ran for Sweden in the first place. This isn't the first time an American RC-135 has faced harassment from Russian fighters, and in the most recent incident preceding this one, a Russian Su-27 'Flanker' came within 100 feet of the RC-135, a fairly dangerous maneuver. In that case, the American plane plowed on with its mission. So why the difference in action taken here? My personal theory is that it was to avoid something like the Hainan Island Incident. Back in 2001, an American EP-3 spy plane collided with a Chinese fighter jet, and the EP-3 was forced to make an emergency landing on Hainan, a large Island off the coast of China. Hainan, coincidentally, is also home to numerous Chinese military installations, including a main People's Liberation Army-Navy submarine base. After colliding with the Chinese jet, and even after coming to a halt on the tarmac after following an emergency landing procedure, the crew desperately attempted to destroy documents and equipment on board, which included pouring hot coffee over all of the motherboards and taking an actual fire axe to all the other computers. Even still, the crew didn't manage to destroy everything. It's never been publicized what exactly the Chinese military learned from the downed EP-3, though it probably was not insignificant. The crew was eventually repatriated, as was the plane. The crew was all in one piece, though the same couldn't be said for the EP-3. The Chinese military completely disassembled it, and shipped it back to the United States in crates. So could that be what the RC-135 crew was trying to avoid? It's possible, especially seeing as how they were flying close to the heavily-militarized Russian exclave of Kaliningrad, according to the Times report. With Russian fighter jets flying so close to the plane, it might have seemed to be a real possibility that one would collide with it, forcing the RC-135 right into the hands of the Russian military and president Vladimir Putin. And not only would that provide President Putin with a huge intelligence coup, it would've handed him a huge diplomatic one as well. Which would've made the already-complicated relationship with Russia even more complicated, as I don't think the American Department of Defense wants to deal with President Putin while he's got one of their planes. Especially when you're trying to get him to stick to a treaty. We've reached out some of our sources, and will let you know if they confirmed this is the case.